Station at the Basilica of St. Peter’s in Rome. This Octave is entirely consecrated to the neophytes. The week was for them a continual feast, a spiritual feast; and they kept their white baptismal garments, which were not laid aside until the following Sunday (in albis deponendis). The Masses of this Octave allude, like that of Pentecost, sometimes to the Resurrection, sometimes to Baptism. Let us follow the example of the neophytes, let us all be one in mind and heart, in proclaiming together our faith in the risen Christ Jesus our Lord. Among the early Christians the Easter festivities were prolonged for the entire week; to no other feast was so much solemnity given. During this week Rome kept continuous festival; business transactions were suspended; every morning the stational Mass was celebrated at one of the chief basilicas. The station at St. Peter’s brings to his tomb the newly bap-tized and bears witness in the Mass to the lively faith of the Apostle in whose house to-day the Roman Church is desirous of renewing, as it were, the paschal feast. In the Epistle St. Peter lifts up his voice and proclaims the glory of Christ’s Resurrection. In the Gospel mention is made of the apparition of Our Lord to Peter on the. evening of Easter Sunday. The disciples on the way to Emmaus knew the Lord in the breaking of the bread. 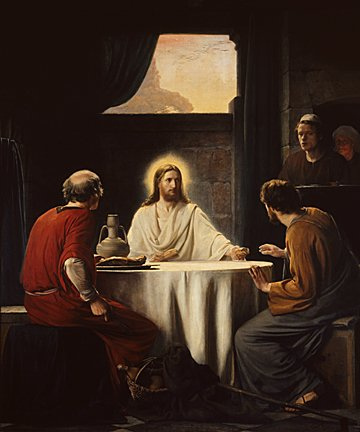 It is probable that this was the eucharistic bread; as the Savior at the Last Supper received the Eucharist first Himself, in all likelihood He did so again after His Resurrection. The Prayer speaks of the paschal Sacrament as being closely bound up with the redemption of the world. The spiritual Israel has come forth from the slavery of Egypt. May the Lord then protect this newly won liberty. Lesson from the Acts of the Apostles. In those days, Peter standing in the midst of the people, said: Men, brethren, you know the word which hath been published through all Judea; for it began from Galilee. after the baptism which John preached, Jesus of Nazareth; how God anointed Him with the Holy Ghost, and with power, who went about doing good and healing all that were oppressed by the devil, for God was with Him. And we are witnesses of all things that He did in the land of the Jews, and in Jerusalem; Whom they killed, hanging Him upon a tree. Him God raised up the third day, and gave Him to be made manifest, not to all the people, but to witnesses preordained by God; even to us, who did eat and drink with Him after He arose again from the dead. And He commanded us to preach to the people, and to testify that it is He Who was appointed by God to be judge of the living and of the dead. To Him all the prophets gave testimony, that by His name all receive remission of sins who believe in Him. This is the day which the Lord bath made: let us be glad and rejoice therein. V. Let Israel now say that He is good, that His mercy endureth forever. Alleluia, alleluia. V. (Matt. 28: 2) An angel of the Lord descended from Heaven, and, coming, rolled back the stone, and sat upon it. At that time, two of the disciples of Jesus went that same day to a town which was sixty furlongs from Jerusalem, named Emmaus. And they talked together of all these things which had happened. And it came to pass that while they talked and reasoned with themselves, Jesus Himself also, drawing near, went with them. But their eyes were held that they should not know Him. And He said to them; “What are these discourses that you hold one with another as you walk, and are sad?” And the one of them, whose name was Cleophas, answering, said to Him: Art Thou only a stranger in Jerusalem, and hast not known the things that have been done there in these days? To whom He said: “What things?” And they said: Concerning Jesus of Nazareth, Who was a prophet, mighty in work and word before God and all the people; and how our chief priests and princes delivered Him to be condemned to death, and crucified Him. But we hoped that it was He that should have re-deemed Israel: and now, be-sides all this, to-day is the third day since these things were done. Yea, and certain women also of our company affrighted us, who, before it was light, were at the sepulchre, and, not finding His body, came, saying that they had also seen a vision of angels, who say that He is alive. And some of our people went to the sepulchre, and found it so as the women had said, but Him they found not. Then He said to them: “O foolish, and slow of heart to believe in all things which the prophets have spoken! Ought not Christ to have suffered these things, and so to enter into His glory?” And, beginning at Moses and all the prophets, He expounded to them in all the Scriptures the things that were concerning Him. And they drew nigh to the town whither they were going; and He made as though He would go farther. But they constrained Him, saying: Stay with us, because it is toward evening, and the day is now far spent. And He went in with them. And it came to pass, whilst He was at table with them, He took bread, and blessed, and broke, and gave to them; and their eyes were opened, and they knew Him, and He vanished out of their sight. And they said one to the other, Was not our heart burning within us whilst He spoke in the way, and opened to us the Scriptures? And, rising up the same hour, they went back to Jerusalem, and they found the eleven gathered together, and those that were with them, saying, the Lord is risen indeed, and hath appeared to Simon. And they told what things were done in the way, and how they knew Him in the breaking of bread. An angel of the Lord descended from Heaven, and said to the women, He whom you seek is risen as He said. Alleluia. The Lord is risen, and hath appeared to Peter. Alleluia.